Are You Really Worshipping if You Don't Sing? Recently diagnosed with Vocal Cord Dysfunction, I struggle to sing in church these days. Sometimes I just mouth the words. But is that a problem? Does worshipping God require my singing? And further, why not just pray together and preach in our worship services? Why not watch others perform songs? Does the congregation have to sing? Certainly, we can worship God in our prayers, in our study of scripture and even in our acts of love and service. A person who cannot speak, let alone sing, can always worship the Lord. But I’ve learned the Bible gives much weight to the subject of singing. Our Father finds great pleasure in our worshipful songs. He loves to hear us sing. In fact, in Psalm 96:1-3 and 47:6, we find the word “sing” seven times! There are hundreds of references to singing in scripture. A song of praise is always “fitting” (Psalm 147:1). And we’re not just invited to sing. It’s a matter of obedience. Believers are commanded to sing when they meet together (Ephesians 5:19; Colossians 3:16). Someone has said there are about 50 direct commands to sing. God provided us with examples of singing in the Trinity. The Father exalts over His people with “loud singing” (Zephaniah 3:17), Jesus sang with his disciples (Matthew 26:30), and a fruit or “effect” of being filled with the Holy Spirit is various kinds of singing (Ephesians 5:18b-19). God provided us with a Psalter, Israel’s book of songs, to show us examples of types of songs to sing. And—perhaps because He knows some can’t carry a tune—He stresses the importance of a song “with your heart” (Ephesians 5:19). What we sing matters, of course. Colossians 3:16 invites us to respond to the Word of Christ. We focus on objective gospel truths, and don’t only sing about the subjective ramifications that truth might have on us. It’s not all about our emotional highs! We see this focus on gospel truth in the hymns of the Wesley brothers, and more recently in the Gettys’ contemporary lyrics. We can sing songs that complement preaching, songs that help us confess our common beliefs together. Incidentally, singing more about the truth of scripture instead of our personal experiences might help us not “sing lies” so much in church—like “All to Jesus I surrender” when we have no intention of yielding to Christ. We are to do all to the glory of God, and that includes our singing (Ephesians 5:19; Colossians 3:17). It all matters: our choices in music, how songs are presented, etc. A recent complaint in churches is: “People aren’t singing in worship anymore.” This is sad, since The Reformation returned worship to the people and a printed hymnal made singing together more accessible. But today, people have become spectators, and there are likely many other reasons people aren’t singing along. They may not be familiar with the songs, the music might be too loud to hear others singing, they might not have a shared body of music (given the huge number of new songs available), or the music might not be suitable for singing together—too high, too low or other technical issues. Maybe churches are simply succumbing to the performance culture. There are many attitudes about music in our churches too. Some people say, “The words are dependent on the music,” and they won’t join in worship unless they hear their favorite style of music. Others think music undermines the words, fearing the power music might have over people. But God seems to place words and music together. Music is meant to enhance and support the lyrics. We should never consider singing simply a “warm up” for worship; it’s an integral part. Singing is important because it helps us remember concepts and words. In Deuteronomy 31:21, God instructed Moses to teach the people a song to remind them who they are and Whose they are. Scientists tell us our brain is hardwired to remember and categorize patterns in music. Just as we quickly remember television jingles and recall nursery rhymes, well-constructed songs in the church can provide links or pathways to important truths stored in our mind. We often memorize these songs when we hear them repeated in worship services. Songs in the church should be crafted with excellence. They should be pleasing and singable. And there’s nothing wrong with combining traditional tunes with fresh, God-honoring melodies. Singing is important in worship to help us engage the lyrics emotionally. Jonathan Edwards expressed it this way: Music helps “to excite and express religious affections.” Music is meant to engage our mind and soul with God and His truth. Music can help us express reverence, repentance, grief and a whole range of emotions. It can calm us, as Saul’s spirit was calmed by David’s harp (1 Samuel 16:23). It is a path to joyful praise (Psalm 9:2; James 5:13b) and can well up from gratitude (Colossians 3:16). Music often strengthens us in trials (Psalm 59:16; 63:7; Acts 16:25). Christians must boldly sing the “new song” of the believer, the song of the redeemed (Psalm 40:3; Revelation 5:9). 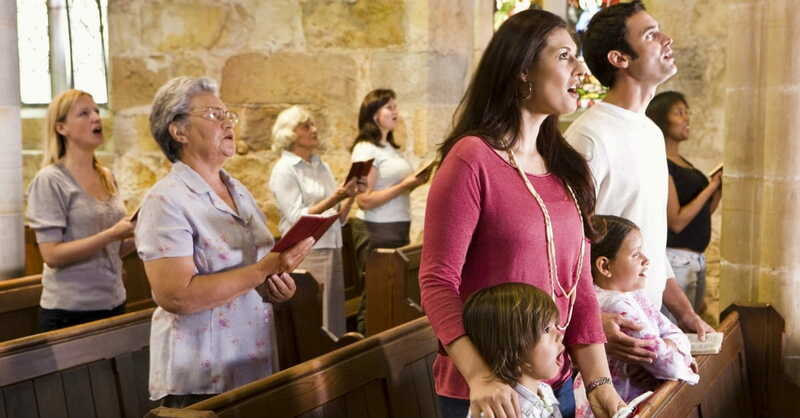 Yes, singing in church is powerful to help unbelievers know more about God and His “wondrous works” (Psalm 105:1-2), but it also builds up the Body of Christ. We are strengthened as we hear people confessing truth together, taking on the enemy together. Singing builds unity with purpose. It’s not the style, but the focus of the song that unites believers. Jesus, our Savior, must be at the center of our singing. He is to occupy the core of our worship, because He is the reason we can praise.